Taylor Swift’s Reputation Tour began Tuesday night in Glendale, Arizona. We hear 60,000 fans turned out to watch the “Look What You Made me Do” singer jam out. And backing her up is the talented crew of Reputation tour dancers. You’d be hard-pressed to find a sexier, more talented bunch of performers, which has led us to do a bit of social media stalking on our own. We dug into the individual Instagram accounts of the 16 Reputation tour dancers, and present them for you here. You may remember Green from that viral video he shared of himself telling his Mom he had just booked Swift’s 1989 World Tour. Since then he’s gotten the opportunity to dance for some of the most influential artists in the industry, including Justin Timberlake, Selena Gomez, The Weeknd, Mary J. Blige, Ricky Martin, Pitbull and Ellie Goulding. Born and raised in Queens, New York, Toshi moved away from the city to study at Las Vegas Academy. Toshi has also danced onstage alongside Jabbawockeez, Camila Cabello and many other artists. Known for his unique sense of style — both onstage and off — Gilmore danced alongside Rita Ora at the 2017 Teen Choice Awards. The 18-year-old Houston native got some screen time earlier this year when she danced with Zedd and Maren Morris for their “The Middle” music video, which first aired during the 2018 Grammy Awards. Born in Kyoto, Japan, Udo moved to New York to pursue his dancing career in 2005 at age 18. Since then he’s danced alongside Madonna in her Sticky and Sweet Tour in 2009, in four of Jason Derulo’s tours, in Swift’s 1989 World Tour and, most recently, in Justin Timberlake’s Super Bowl LII halftime show. Born and raised in Tokyo, the professional dancer-choreographer has worked with Madonna, Britney Spears, Katy Perry and Jason Derulo, and has been on three world tours as a principal dancer. Hotel Room Series by @markvillaver ?? In 2015 this Tampa-based dancer made it to the top 14 dancers on Season 12 of Fox’s So You Think You Can Dance. Villaver is originally from Hawaii. In 2012 he moved to Los Angeles to pursue a professional career in dance, which led him to a special performance on the Season 11 finale of American Idol. From there he has danced for Ariana Grande and Ricky Martin, as well as on Swift’s Red Tour and 1989 World Tour. From Australia, Stewart has danced for Justin Bieber, Selena Gomez, Kylie Minogue, Katy Perry, Rihanna, Ellen Degeneres, Macy Gray, Ariana Grande, Iggy Azalea and Pharrell Williams. Dancing since the age of 13, this Atlanta native has worked with Swift before in her star-studded “Bad Blood” video and has choreographed routines for Demi Lovato. This is Henderson’s third tour with Swift. He was on the Red Tour and the 1989 World Tour. In 2016, Sia had then-19-year-old dancer Mincone alternate performances with Maddie Ziegler during her lengthy set at Coachella. In addition to starring in Sia’s “The Greatest” music video, Mincone danced with Nick Jonas during the 2017 American Music Awards. Since the young age of 4 years old Nadina Olmo has pursued her passion for dance. After attending high school in California, she made the move to New York City, where she received a scholarship to the Broadway Dance Center program. ? ? N A R C I S O ? ? Giofré is originally from Italy and has made a name for himself with his YouTube videos and the debut album Call on Me in 2013. He performed alongside Swift on her 1989 World Tour. Kodish first made his mark on Hollywood during the 2012 film Step Up Revolution. Since then he has had great success performing at some of the world’s most iconic landmarks. Performing since he was 5, Landgrebe has danced with Justin Bieber and Janet Jackson. Also, he was featured on the final season of Glee, as well as the Just Dance video game franchise. 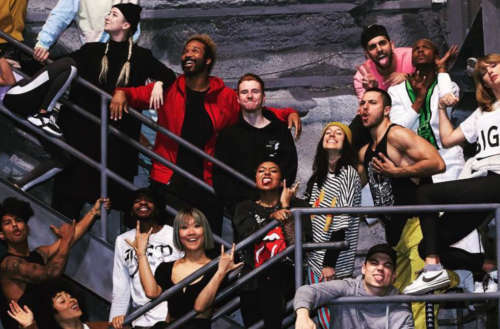 What do you think of the Reputation tour dancers? Do you have a favorite? Sound off in the comments.